Squash is a game played around the world and has as big a following professionally as it does in amateur ranks. The game dates back to 19th century with variations of the game (then called racquets) evolving into the modern game as we now know it. Whilst squash isn’t currently an Olympic sport, its pinnacle comes in the form of the Squash World Championships where the best players from around the world compete to be the ultimate squash champion. The object of the game is hit the ball off the back wall until you manage to make your opponent fail in returning the ball. Every time you do so you will receive a point. Points make up sets, which in turn determine the winner of the match. 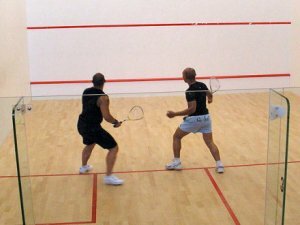 Squash is played between two people in a box like room. All that is needed is a squash racket (similar to a tennis racket but smaller head size) and a squash ball. The squash ball is around 2 and a half inches in diameter and made from rubber. There are 5 different speeds of squash ball ranging from super slow (competition standard) to fast (more beginner standard). The ball is generally pretty low bouncing, especially the super slow balls, which make it tough to return the ball. There are many lines on a squash court. The first line is out line that runs across the top of the back wall and down the sides of the side wall. Any ball hitting outside this area is deemed out and a point is awarded to your opponent. A board runs along the bottom of the back wall which is technically the ‘net’. If the ball hits into the board then it is deemed a foul. 3 feet above the board is the service line. All serves must hit above this line for it to be a legitimate serve. The back of the court is split into two rectangular sections where a player must start from before each point. A service box is in each section and a player is required to have at least one foot in whilst they serve or are waiting to receive the serve. Scoring a point can come one of 4 ways: the ball bounces twice before your opponent hits the ball, the ball hits the back board (or net), the ball goes outside the outline or a player causes interference purposely to prevent their opponents from getting the ball. There are two methods of scoring Squash. The first is called ‘PAR’ where you play first to 11 points and you can score a point from either yours or your opponents serve. The second is a more traditional style where you play first to 9 points but can only score points off your own serve. The 11 point PAR scoring system is now the official scoring system in professional ranks and the majority of amateur games. In order to win the game you need to reach the required amounts of sets determined before the start of the match. Most sets are best of 5 games, so the first to that number wins. Games can be played by either two (singles) or four (doubles) players at one time. You must hit the ball with your racket within the boundaries on the back wall. The ball can hit the side wall at any time as long as at some point it hits the back wall. A let is called when a player accidently gets in their opponents way and is unable to get out the way. A foul is called if the player purposely tries to get in the way of their opponent. If a game gets to 10-10 then a player must win by two clear points to win that game. You cannot hit the ball twice and you cannot carry the ball. When serving one foot must be within the service box; the same goes for your opponent. Upon returning a serve you may hit the ball on the volley or after it bounces.